You want loot, we have loot! 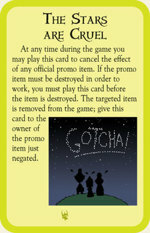 We have a selection of shiny new Munchkin promos to add to your collection! Curse! 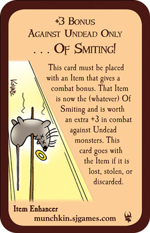 For Munchkin, Curse! Cat Nap will give your friends nightmares, and add . . . Of Smiting! to your items to return the undead from whence they came. The Onomatopeon will biff bam pow you right in the kisser in Super Munchkin. 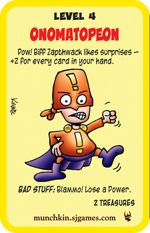 If you prefer Munchkin Cthulhu, there's Embrace the Madness to ignore all the pesky downsides of insanity, or The Stars are Cruel can counter any of these nasty promos -- because Cthulhu says, that's why! We've also added the Car Wars patch with stylish silver and black lettering. Add it to the shoulder of your autoduelling jacket! You don't have an autoduelling jacket? You should probably get one to store all your patches.